It's been about six months since we heard Comcast was running tests of a brand new set-top box platform but now thanks to one of our tipsters we're able to see it in action and find out what's on the way. From the remote to the box to the menus it's all new, and appears to be a major step forward for the company and already includes familiar apps like Facebook and Pandora. The look of the new guide mirrors what we'd seen in the manual received by the FCC in December and demonstrated on Samsung HDTVs at CES earlier this year, intended for 16x9 displays and moving the main navigation elements to the top. The redesigned remote has a few new buttons and while it hasn't gone the QWERTY route, the software and hardware are designed around T9-style access for searching and messaging, with a button and microphone icon suggesting voice control is a possibility as well. The DVR itself is the Pace box we'd seen previously, although there was differing information on the number of tuners and hard drive space available, suggesting these details may still be up in the air. 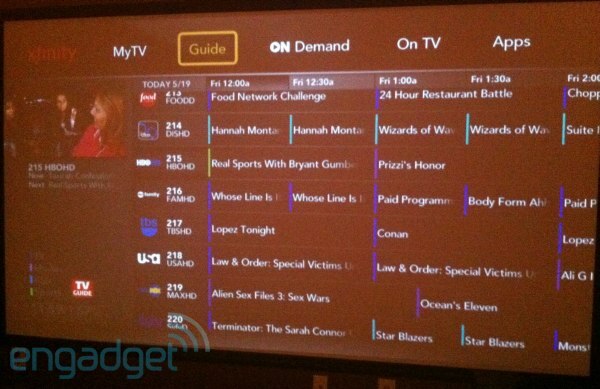 Check after the break for more details and our tipster's first hand account of the new TV experience. "Major step for Comcast/Xfinity. The old guide was obviously very dated, and Spectrum offers an updated, modern and user friendly guide. There is a full TV guide that lets you search for programs/times/actors/genres/you name it, and there is a mini guide that keeps half the screen as the current program you are watching. Channel logos are more prevalent throughout the guide with detailed information about each show as it's highlighted. Every option is available from here as far as recording options, upcoming shows of the same title, similar/suggested shows, etc. A cool feature is a last 9 channels watched list that allows switching between multiple channels a breeze. Imagine 9 different football games on and being able to go to each game very quickly, as the boxes are labeled with what program is on that channel. A much more connected feel with plenty of visuals, data, and options as compared to the old guide." 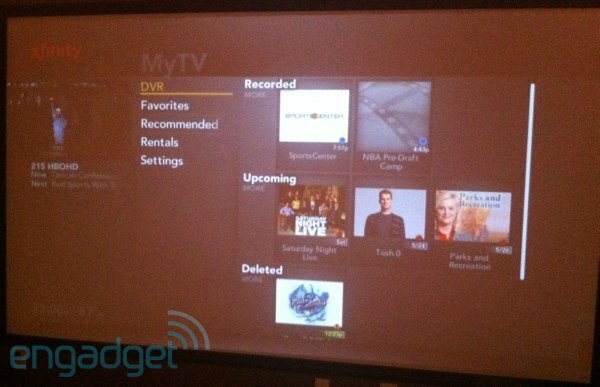 "I haven't delved into the DVR much, but I did test it out. The installer said it is a 4 tuner DVR allowing me to record 3 programs while I watched a 4th. However, the user guide said I could only record 2 and watch a 3rd. Didn't test this out, but either is enough for me. It appeared to be the standard DVR functions that you would expect. I asked the installer the size of the hard drive, and he said 1 terabyte with around 160 hours of HD recording. Again, the book said 500 GB, so not sure what is correct here." "The apps section is pretty cool. 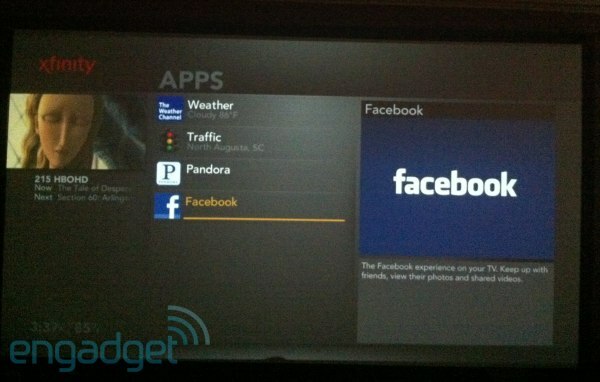 As of now, weather, traffic, Facebook, Randora, and Twitter are the apps available. Traffic and weather data sync automatically, but you have to go to spectrum.comcast.net to sync Pandora, Facebook, and Twitter." "The weather app is great. It offers real time forecasts, 5 day forecasts, and a nice radar map showing any rain on the way. 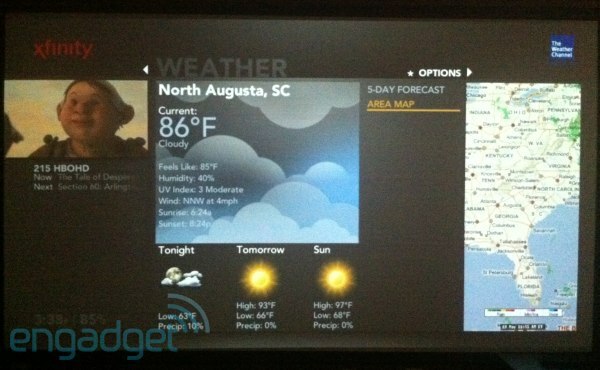 You can choose multiple locations to view weather all over the country. The traffic app is also handy. Not so much for me living in North Augusta, but I changed the location to Atlanta and saw multiple traffic warnings and accident indicators. This is all done over a road map overlay with a key showing what the traffic incidents are. Accidents, congestion, road work, delays are all indicated on the map. You can also set up a destination route if you were going out of town. Set starting and finishing points, and the app tells you of any road warnings for that route. Pretty cool stuff." "The Facebook and Twitter apps are what you would expect. 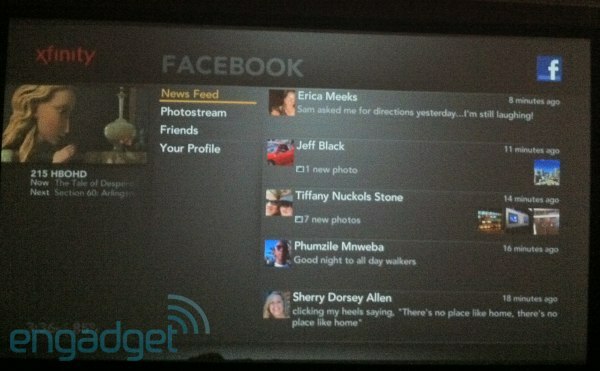 Your feeds are displayed on the screen, so you can check your profile and any updates your friends have made. It's very similar to a mobile app and doesn't offer too many editing options. I don't see myself using these much, as my mobile apps (iPhone) for these clients are much faster and easier to get to. The Pandora app is something I see people using a lot. Very similar to the computer and mobile apps with the same thumbs up/down ratings we are used to. The user created channels automatically show up on the right, as well as a mix option that randomly selects channels. I was told by the developer there is no cap on usage for this pandora app. Album art and song data are displayed on the screen as well." "The remote has some very intriguing pieces to it. It's a new Xfinity labeled remote that uses an IR blaster. According to the developer, the remote can be updated wirelessly when new updates are available. The standard circle of buttons with the OK button in the middle dominate the remote, with an Xfinity button above to take you to the guide, dvr, on demand, settings, and apps. What's also neat, and very useful, is the numbered buttons double as T9 text input. For instance, if you want to watch Tosh.0, type 867 and immediatly Tosh.0 appears, along with a list of any other programs, actors, channels, genres, teams, etc that match that T9 combination. I used this multiple times to search for programming for my DVR. You don't have to go to a special location for this. Just type it in as you were dialing in a new channel. Can't remember where HBO is? Type 426 and channel 426 will show up first on the list, but HBO will be second. Very handy tool and kudos to Comcast for thinking of this." "Now, look at the picture of the remote closely. There is a curious microphone icon at the top of the remote. 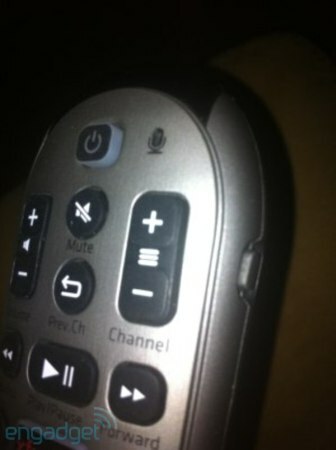 On the side of the remote, there is a button that is not labeled, nor mentioned in the user guide. I called the special Spectrum phone number, and the specialist had no idea what they were for. On the back of the remote, there is a small speaker above the battery compartment. The only thing I could think of was some sort of voice guided control for the guide using the side button, similar to a walkie talkie. Either that or they are listening in on me (scary thought). The developer warned me about some kinks that are being worked out, and I have already experienced some. The apps section worked perfect through the first part of yesterday, but stopped working last night (which is why there are no pics of the apps). Tried to reset the box, but it didn't help. Also, I paired the controller with my pioneer receiver, but it only works for 5 minutes or so, then quits working. Apparently, this is a known issue and they are working on it."